One of the central tasks of keeping the family healthy is to enable and encourage members to spend time together away from business concerns, as Elle Hansen explains here. Family businesses are complex and challenging to operate successfully because they are actually two separate entities — the family and the business. Each of these entities has its own environment and dynamics and the essential challenge for the family business leader is to make sure the needs of both family and business are met. If the business is growing and profitable while the family is in a shambles, rife with miscommunication and conflict, the management cannot be considered successful. One of the central tasks of keeping the family healthy is to enable and encourage members to spend time together away from business concerns. By congregating outside the world of business, family members get to know one another, gain deeper understanding of each other’s needs and concerns, and improve their ability to communicate. A family that plays together is more likely to be able to work together. This sort of family time is different from structured family meetings. Those are organized sessions with agendas and often the assistance of a professional facilitator. They are for members to formally discuss and endorse important matters such as family vision, mission statements, goals for the future, succession plans and the like. Families also need unstructured play time. Enjoying a meal, taking a tour, or attending an event as a family all provide members with opportunities to interact differently than they would in a formal family meeting. Volunteering as a group can create a special sort of family gathering that is neither all work nor all play. Spending a few hours helping out at a charity event can build pride and powerful bonds of camaraderie between family members who might otherwise have little in common. Informal get-togethers where business issues are not the central topic offer opportunities for developing, refining and transmitting family rituals and traditions that can be important for creating a strong culture. Stories about past gatherings become part of the family lore and build emotional bonds between factions that may tend to oppose one another on business matters. Away from the hierarchy of the workplace, junior family members can relate more openly to senior leaders, and vice versa. This can aid in inter-generational understanding, and help identify prospective leaders’ attitudes and desires, while also allowing current leaders to influence the upcoming generation. Business family leaders should initiate regular informal outings involving both family members who actively work in the business and those who limit their involvement to ownership. These outings can center on a meal, an event, volunteer work, a tour or other activity. The actual activity is not what’s important. The value of family time is that it helps the family. 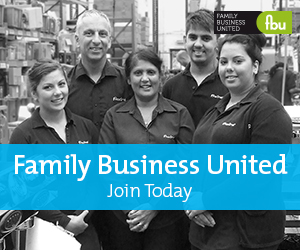 Families that play together, stay together, and business families that stay together help the business be more successful.